Vista Point is a neighborhood of medium-sized homes on a small footprint located in French Gulch, less than one-half mile from the Blue River and Highway 9. A paved bike path and public transportation serve the road through the Vista Point homes for sale, and nearby trails make Vista Point homes a short walk from the center of town, and give it quick access to the Breckenridge Rec. Center oand City Market. Little Red School House, a daycare center, is in the neighborhood. French Gulch Road eventually climbs the saddle between Mt. Guyot and Baldy Mountain, and spurs off this road offer additional back country access and a town open space is not far to the east of any Vista Point home for sale. Curious about these beautiful homes? Read more now, or check out the active Vista Point real estate listings below. 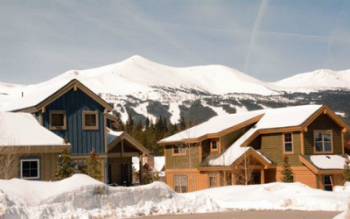 Vista Point homes were developed in 2000 in cooperation with the Summit Housing Authority to increase the inventory of affordable homes in Breckenridge. Many are not, but some lots or homes are deed-restricted and are subject to limitations on rental, occupancy, and resale price. Until this century, there were only a few homes built near French Creek, which had been affected by mining upstream in the two previous centuries. But recent environmental restoration has greatly improved the creek and enhanced the nature beauty of the area significantly. A subtle mix of townhomes and duplexes add diversity in size and price to the three-dozen homes that make up Vista Point real estate. Less than one-tenth of the lots remain undeveloped. Its neighboring subdivisions continue the theme of diversity and make the entire area thrive. Size: 1772 sq. ft. to 3065 sq. ft. Amenities: close to town, often affordable, designed with new urbanism, mixed neighborhood, close to daycare, French Creek and trails in that gulch. Located in the French Creek valley, Vista Point is slightly east of Highway 9 and north of downtown Breckenridge. From the traffic circle at the north end of Breckenridge, continue a few hundred yards to CR 450, turn east (right) and within one-half mile, turn onto Shepards Lane and Vista Point. We just love the beauitful homes for sale in Vista Point and we are so excited to tell you more. Contact us now, or give us a call at (970) 453-2200 to get the conversation started.